My library reading group is Book Bears. We read a book each month, and I host the discussion. These are mostly second graders, eager to read. We have a full and lively house, until… Let me back up. Many things have happened. When Book Bears first met in September, everyone brought their favorite book that they read over the summer. I did, too. 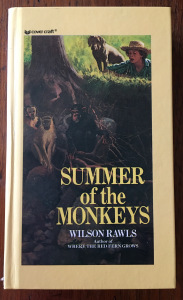 I brought Summer of the Monkeys by Wilson Rawls. He was also the author of Where the Red Fern Grows. Every summer I get lost in books, just like the Book Bears. Sometimes there is one that sticks with me for a long time. A very long time. This one did. His writing is fluid. His words are a quiver of arrows, shot to the heart. Thank you for sharing this, Alexis.